Home / Latest / Judicial Watch Sues To Expose DOJ FISA Warrant Abuses + More! Just how much did the Department of Justice abuse the Foreign Intelligence Surveillance Act (FISA) when it decided to go after Donald Trump? And what is the DOJ hiding from Congress (and the American people) about this scandal that is worse than Watergate? We are determined to find out. Judicial Watch just filed a Freedom of Information Act (FOIA) lawsuit against the U.S. Department of Justice for all records of communications between both the DOJ and the Federal Bureau of Investigation with members of the Senate Judiciary Committee and the House Permanent Select Committee on Intelligence regarding the FISA warrants against foreign policy advisor Carter Page and other members of Trump campaign (Judicial Watch v. U.S. Department of Justice (No. 1:18-cv-01088)). • Any records of communications between DOJ officials and Members of the U.S. Senate Committee on the Judiciary (“USSCJ”) and/or their staff members regarding USSCJ’s attempts to acquire the applications and renewals for FISA warrants against Carter Page and any other members of President Trump’s presidential campaign, as well as any records relating to or forming the basis of those FISA warrant applications/renewals from June 1, 2016 to the present. 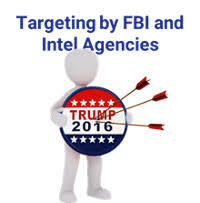 • Any records of communications between DOJ officials and Members of the House Permanent Select Committee on Intelligence (“HPSCI”) and/or their staff members, regarding HPSCI’s attempts to acquire the applications and renewals for FISA warrants against Carter Page and any other members of President Trump’s presidential campaign, as well as any records relating to or forming the basis of those FISA warrant applications and renewals from June 1, 2016 to the present. Our latest federal FOIA lawsuit aims to uncover details of the DOJ/FBI obstruction and contempt for Congress on Spygate. The Deep State doesn’t want Congress, Judicial Watch or the American people to see the full extent of its abuses targeting the Trump campaign and now President Trump. The lawsuit is the latest of more than two dozen active suits we have filed relating to the DOJ cover-up of the abuses and the stonewalling of Congress related to the year-long Mueller investigation into alleged Russian collusion in the 2016 election. Our work is impressive and shows how Judicial Watch is really the only game in town on Spygate and the Deep State anti-Trump targeting scandal oversight. On April 6, 2018, The Hill reported that the Justice Department “agreed to allow additional access by the House Intelligence Committee to view four surveillance applications” against Page, “calling it an ‘extraordinary accommodation.’” The public has still not been told what was contained in those applications. On May 3, 2018, we sued the DOJ for copies of all transcripts of hearings before the FISC regarding applications for or renewals of FISA warrants relating to Page and/or Michael Flynn. In February 2018, we sued the DOJ for FBI documents regarding the FISA warrant application submitted to – and responses from – the FISC related to alleged collusion between Russia and Trump campaign associates (Judicial Watch v. U.S. Department of Justice (No. 1:18-cv-00245)). In January 2018, we sued the DOJ for text messages and other records of FBI official Peter Strzok and FBI attorney Lisa Page (Judicial Watch v. U.S. Department of Justice (No. 1:18-cv-00154)). Strzok reportedly oversaw the FBI’s interviews of former National Security Adviser, General Michael Flynn; changed former FBI Director James Comey’s language about Hillary Clinton’s actions regarding her illicit email server from “grossly negligent” to “extremely careless;” played a lead role in the FBI’s interview of Clinton; and is suspected of being responsible for using the unverified dossier to obtain a FISA warrant in order to spy on President Trump’s campaign. And last month, we sued the DOJ for records about top Justice Department official Bruce Ohr and his wife Nellie Ohr’s involvement in the Trump dossier authored by Christopher Steele (Judicial Watch v. U.S. Department of Justice (No.1:18-cv-00490)) and (Judicial Watch v. U.S. Department of Justice (No.1:18-cv-00491)). We’re doing all of this on your behalf, because we simply can’t trust the Justice Department (or Congress, for that matter) to deliver justice, accountability and transparency in this scandal of all scandals. For years Hillary Clinton and her aides played fast and loose with the law in their email practices, and now the State Department is playing fast and loose with our efforts to get to the bottom of it. We are fighting the department for a full production of records responsive to a Freedom of Information Act (FOIA) lawsuit for the emails found by the FBI on Anthony Weiner’s laptop. According to then-FBI Director James Comey, Weiner’s laptop contained “hundreds of thousands” of emails of former Secretary Clinton. In fighting the State Department’s effort to close the case, we refer to the State Department claim that only 3,000 of those “hundreds of thousands” are agency records and 147 total emails were unique agency records. We argue that the State Department has not released information on the total number of emails that it reviewed, how it reviewed them, how many emails were personal and not agency records, and how the agency would have made those determinations. This filing is part of our extensive and ongoing investigation into the Hillary Clinton email scandal. The investigation has produced numerous examples of Clinton using her non-“state.gov” email system to transmit classified information. Our April 2014 pivotal revelation of the Benghazi talking points originating in the Obama White House brought about the May 2014 formation of the House Benghazi Committee. In February 2015 the State Department admitted to the court that it needed to make “additional searches” of Benghazi-related material. In March 2015 Clinton admitted to using a non-government email system. In September 2017 we made public 1,617 new pages of documents from the State Department revealing numerous additional examples of classified information being transmitted through Abedin’s unsecure, non-state.gov account, as well as many instances of Clinton donors receiving special favors from the State Department. On January 4, 2018, we revealed that at least 18 classified emails in a total of 798 documents produced by the State Department from the FBI’s investigation into former Secretary of State Hillary Clinton’s illicit email system were found on Anthony Weiner’s laptop. Thirteen emails contained classified information and discussions about Saudi Arabia, The Hague, Egypt, South Africa, Zimbabwe, the identity of a CIA official, Malawi, the war in Syria, Lebanon, Hamas, and the PLO. After uncovering the Clinton email scandal, we now want a full accounting of the Hillary Clinton emails found on Anthony Weiner’s laptop. We’ve confirmed that there were classified Clinton emails on the Weiner laptop, which would have been enough to get anyone else arrested. Is there anything more bizarre than a former congressman in prison for sexually communicating with teenage girls having had classified emails of a secretary of state on his laptop? The Clinton email scandal gets worse every day. MS-13 gangsters aren’t the only dangerous people crossing our southern border. For years we’ve told you about ISIS operatives crossing unhindered into the United States. Now there is some positive news. Our Corruption Chronicles blog describes a new effort to thwart these evildoers. A Mexican border region that Judicial Watch exposed years ago as a hotbed of Islamic terrorism is finally getting a wall to replace laughable “road barriers” that, not surprisingly, have failed miserably to secure the area. The big question is, why did it take so long? The much-needed fence will be erected between Santa Teresa, New Mexico, and Ciudad Juárez in the Mexican state of Chihuahua. It’s an area where ISIS cells operate and Juárez Cartel smugglers help terrorists through the desert and across the border. A 20-mile section of existing “vehicle barrier” located west of the Santa Teresa Port of Entry will be replaced with an 18 to 30-foot high bollard-style wall, according to an announcement issued by Customs and Border Patrol (CBP). The announcement includes pictures of the existing railing, which is a joke. Last year 25,193 illegal immigrants were apprehended and 34,189 pounds of marijuana and 140 pounds of cocaine were seized in Santa Teresa, according to government figures. The problem is far more serious. Back in 2015 Judicial Watch reported that ISIS cells are operating in the Santa Teresa region, just a few miles from El Paso, Texas in an area known as “Anapra” situated just west of Ciudad Juárez. Another ISIS cell to the west of Ciudad Juárez, in Puerto Palomas, targets the New Mexico towns of Columbus and Deming for easy access to the United States. The report was among the first in a series resulting from Judicial Watch’s ongoing investigation into the national security threats created by the porous southern border. State and federal Law enforcement officials on both sides of the border, including a Mexican Army field officer and a Mexican Federal Police Inspector, are among Judicial Watch’s sources. At the time, Mexican intelligence sources reported that ISIS planned to exploit the railways and airport facilities in the vicinity of Santa Teresa and that ISIS “spotters” were located in New Mexico’s East Potrillo Mountains. A year earlier Judicial Watch had already published an exposé illustrating the serious threats generated by lax security in this particular region of the southern border. An Al Qaeda terrorist (Adnan G. El Shukrijumah) on the FBI’s most wanted list for years crossed back and forth into the United States from Mexico to meet fellow militant Islamists in Texas and piloted an aircraft into the Cielo Dorado airfield—about 25 miles from Santa Teresa—in Anthony, New Mexico. The same Al Qaeda operative helped plan the 2009 bombing of talk show superstar Oprah Winfrey’s Chicago studios and the iconic Sears Tower (renamed Willis Tower), a story that Judicial Watch broke days earlier. Despite being one of the FBI’s most wanted terrorists, Shukrijumah for years managed to slip in and out of the U.S. through the southern border to meet fellow militant Islamists in the El Paso region. Shukrijumah was eventually killed in an intelligence-borne operation in Pakistan, but the fact remains that he long eluded U.S. authorities by utilizing a vulnerable portion of the Mexican border region to conduct business. We have borders for a reason. Those who would do away with them put all of us at risk.